Stretchmark reducer and skin rejuvenator. In a remarkable turn of events, arguably one of the strangest in the history of cosmetics, women across the country are putting a stretch-mark cream called StriVectin-SD? on their face to diminish the appearance of fine lines, wrinkles and crows? feet. And, if consumer sales are any indication of a product?s effectiveness, StriVectin-SD is nothing short of a miracle. 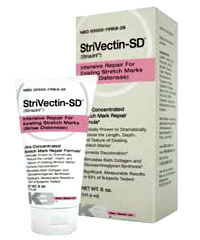 StriVectin-SD includes a proprietary complex of skin firming agents, elasticizers, and skin hydrators… adding up to the most comprehensive topical formulation shown to effectively confront virtually every aspect of visible stretch mark reduction. *The statements have not been evaluated by the Food and Drug Administration. The products are not intended to diagnose, treat, cure or prevent any disease. **If you choose the Autoship Option you will be enrolled in our Auto-replenishment program. 30 days after your initial order you will receive another 30 day supply at the discounted price. No need to remember to reorder. Cancel any time you wish and for any reason. No contract required! !